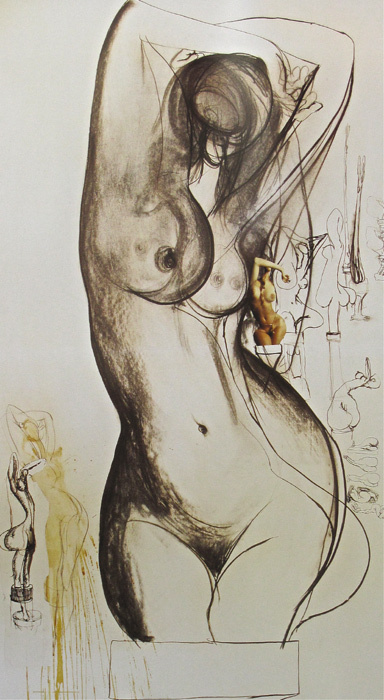 Brett Whiteley Beyond Sculpture No 5, offset lithograph, available framed or unframed at Etching House. Brett Whiteley is one of Australia’s most revered artists. His lyrical expressionism and lack of inhibition placed him at the forefront of Australia’s avant-garde art movement. He won many prizes and awards and his work hangs in numerous galleries, including the National Gallery of Australia in Canberra, the Tate Gallery in London and the Museum of Modern Art in New York. Born in Sydney in 1939, Whiteley grew up in Longueville, NSW and by the age of seven had won his first art competition. He was sent to boarding school at Scots College, Bathurst and in 1956 was awarded first prize in the Young Painters’ section of the Bathurst Show. He left school mid-year and took night classes in drawing at the Julian Ashton Art School in Sydney while holding down a job at an advertising agency. Whiteley’s acclaim continued to grow throughout the seventies and eighties. In 1975 he was awarded the Sir William Angliss Memorial Art Prize. In 1976 he won his first Archibald prize with Self-portrait in the studio and the Sir John Sulman Prize for Interior with Time Past (genre painting). In 1977 he won the Wynne Prize for The Jacaranda Tree (On Sydney Harbour), and in 1978 became the only Australian artist ever to claim the Archibald, Sulman and Wynne art prizes – a unique treble. He was awarded the Wynne Prize again in 1984, and the following year purchased an old T-shirt factory in Surry Hills, Sydney and converted it into a studio. Further renovations followed and in later years the downstairs gallery area was repainted and now houses changing exhibitions. In 1991 he was awarded the Order of Australia (General Division). In the last years of his life Whiteley travelled far and wide, taking in England, Bali, Tokyo, and spending two months in Paris in an apartment on Rue de Tournon. On 15 June 1992 he was found dead from a heroin overdose in a motel room in Thirroul on the NSW coast. The coroner’s verdict was ‘death due to self-administered substances’. He was 53 years old.